In August 1963, I left my job milking 30 dairy cows and joined head coach John Gagliardi and the Saint John's football team for training camp before the fall semester began. Wow, over 50 years! Could it be that long since my first entry into my logbook? I kept track of every penny that I spent as a student going to Saint John's in the mid-1960's. From this, I realize and appreciate the importance of alumni giving. Today, many students don't have the same tight budget, but I'm sure a number of my peers recognized the need to "pinch pennies." There was no complaining of how hard it was. We were just grateful to be where we were. The first entry in the log was the purchase of a prayer book. 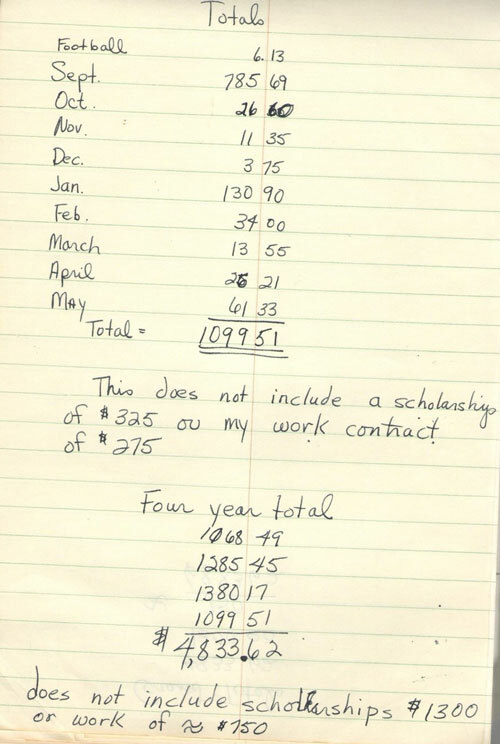 During my first year, I spent $1,543.49, which included $325 in academic aid and $150 from a work contract. My dad wanted me back on the farm during the summer months following my first year. We also built my older brother's home as he was getting married. A few thousand dollars was big money in the 1960s, as I recall my father needing to pay $2,000 a year on his 160-acre farm mortgage. Getting it together was a big deal, especially since his son had chosen Saint John's and not the less expensive local state college. 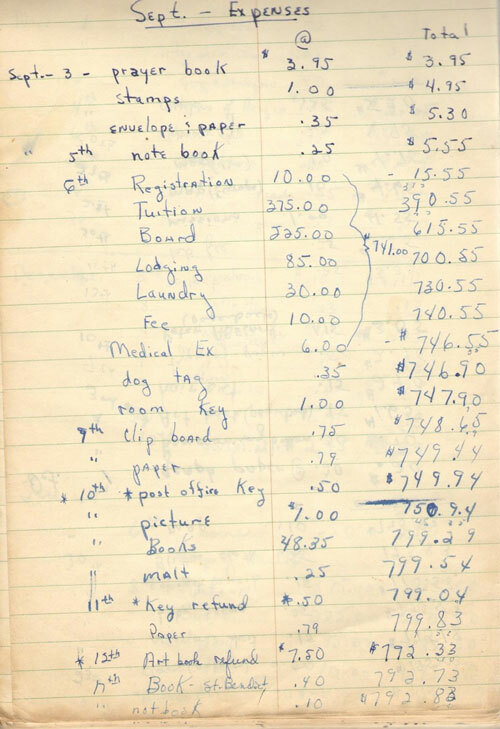 When I returned to SJU in the fall of 1964 I continued my record keeping. 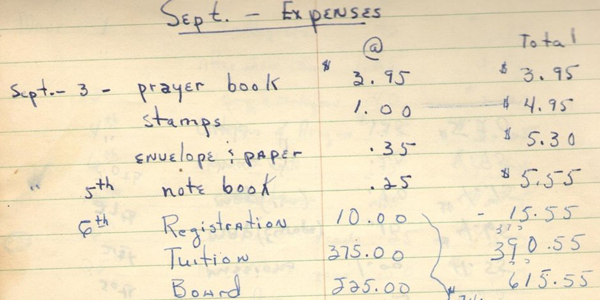 During the 1964-65 school year I spent $1,810.45, of which $325 was academic aid and $200 was a work contract. 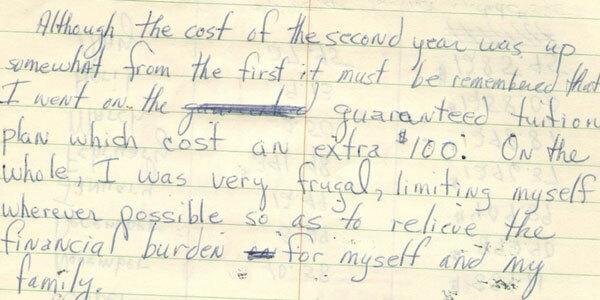 "Although the cost of the second year was up somewhat from the first it must be remember that I went on the guaranteed tuition plan which cost an extra $100. On the whole, I was very frugal, limiting myself whenever possible so as to relieve the financial burden for myself and my family." My roommate, Dr. Richard Baron, MD, and I started saving money by hanging our laundry in our room to dry rather than using clothes dryers. Our room never lacked adequate humidity during winter months. My dad sold the milk cows when he "had lost his slave labor" (me), so I was weaned from the farm in the summer of 1965. I recall my summer job in 1965 in the SJU Admissions Office, working with Fr. Lanfranc (Don LeMay) for 85 cents an hour. I put in many hours as there was plenty of work to do, and working with gregarious Fr. Don was a blessing. Expenditures during my last two years at Saint John's were similar, with the total four-year cost being $4,833.62 out of pocket plus $1,300 in academic aid and another $750 in work contracts. The total for four years was $6,883.62. When you account for inflation since the 1960's there is a multiplying factor of 7.5. My four-year education cost about $52,000 in current dollars. What a bargain Saint John's was! With my bachelor's degree in physics in hand, I left Saint John's in 1967 and subsequently earned a master's degree in health physics from Vanderbilt University. Due to my induction into the Air Force during the Vietnam War era, I was unable to complete my doctorate at Vanderbilt. However, after serving seven years of active duty in the military (and 21 in the reserves), I received a PhD in civil and environmental engineering from Princeton University after working for 18 years on the Princeton fusion project. The past 50 years have gone by much too fast. But by putting one's faith and trust in God, life generally works out OK. In my estimation I was dealt a pretty good hand, although at times it didn't seem so. My SJU class of '67 is setting up a scholarship endowment for our 50th reunion this year. I encourage my classmates to join this effort and I encourage all alumni to support annual giving. I do it at Vanderbilt, Princeton and Saint John's, with Saint John's of course being my favorite. Every dollar makes a difference for those willing to work hard. I encourage all SJU students to take heart and put your nose to the grindstone when times are tough. It's worth the effort. The Class of 1967 will celebrated its 50th reunion June 23-25, 2017 at Saint John's. More information on upcoming Reunions is at www.csbsjureunion.com.